EXLIBRIS LUIGI BERGOMI. VLADIMIR VERESCHAGIN 1948 RUSSIA. DRAGON SLAYER. pencil : C7 col. 39 / 60 signed 98. OLDRICH KUHLHANEK 1940 -2013 Prag Czech Republic. HOMMAGE DALI. pencil : SIGNED. My original oil paintings are not for sale. Here are Giclee prints I produced several years ago. This print is approx. 2" smaller than the actual size of the painting. My influences include Salvador Dali, Bosch, Giger and surrealism in general. FASSIANOS ALECOS, aquatint and drystamp. FASSIANOS ALECOS. Original graphic, aquatint and drystamp. Signed and numbered in pencil 09/40. Title: Tsiou Tsiou. Year: 1998. Published by Pace Prints (label on verso). 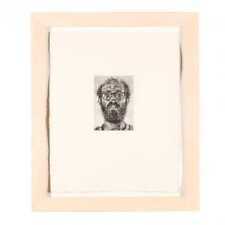 Chuck Close Self Portrait, 1992. Edna Hibel received her formal artistic training at the Boston Museum School of Fine Arts, from 1935-1939. 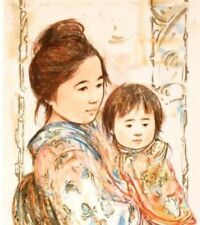 This is a limited edition lithoraph on rice paper numbered and hand signed by Edna Hibel. Edna Hibel was born in 1917 and she grew up in the Boston area. LARRY "PONCHO" BROWN LIMITED EDITION BLACK ART PRINT "QUEEN CLEOPATRA VII"
You are purchasing/investing in a Rare Limited Edition Art Print Entitled "QUEEN CLEOPATRA VII" by Internationally Known Artist Larry "Poncho" Brown, a native of Baltimore Maryland. He primarily works in acrylic. Image size 14 3/4 x 19 3/4". Paper size 17 1/2 x 24". Gustav Klimt. Again, we stress that this print is not a digital copy or scan. Image Size: 8.5" x 10.5". New, Unused in Mint (M) Condition. The Virgins. The print is in good condition. Signed on reverse. Lovely print from 1990's. Great care is taken to precisely recreate Mucha’s original image created in 1900. The signature of the chromist is printed unobtrusively on this lithograph in order to distinguish this recreation from Mucha’s original work. KARIN SCHAEFERS. They were placed in a concentration camp and Karin was the only survivor. She escaped to Brooklyn, New York where she studied art. She eventually married and Italian sculpture and they have a son. OLDRICH KUHLHANEK 1940 -2013 Prag Czech Republic. HOMMAGE FRANCOIS VILLON. EXLIBRIS MUDR.S. SBIRKA EXLIBRIS. Platemark : 137 mm x 86 mm. Lovely print from 1990's. Condition - have spots and folds. Edna Hibel received her formal artistic training at the Boston Museum School of Fine Arts, from 1935-1939. This is a limited edition serigraph on art paper numbered and hand signed by Edna Hibel. OLDRICH KUHLHANEK 1940 -2013 Prag Czech Republic. HOMMAGE WENCESLAUS HOLLAR. EXLIBRIS R. pencil : SIGNED 1990. Solid condition of one of Frank Howell's signed pieces. Signed in the year 1992. He traditionally signs his pieces twice. You can see his signatures under his artwork called "Lakota Shirt Wearer". Rustic frame appeal. No damage. J.W. Waterhouse. Again we stress, that this print is not a digital copy or scan. Paper Size: 9.5" x 12". PAUL WUNDERLICH 1927 - 2010 GERMAN. PAUL WUNDERLICH cataloge raisonne 1983-2004 S. 118 abb.118. N0.808 Ed. Volker Hubert. IN THE CAMPAGNA. LITHOGRAPH 1994. The litho is numbered 36/60. Pencil signed and numbered. Excellent condition and quality. Very hard to see, minor indentation on her puffy sleeve - A couple of pinhead white dots on hair and chair - MUST SEE PICS. Again we stress, that this print is not a digital copy or scan. Image Size: 8" x 9". SUPER RAREANDY WARHOL FOUR PIECE SET WITH ORIGINAL ENVELOPE from MITSUKOSHI TOKYO 1990 EXHIBITION! Edna Hibel received her formal artistic training at the Boston Museum School of Fine Arts, from 1935-1939. 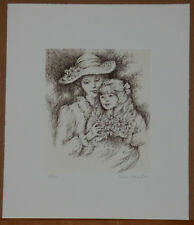 Edna Hibel "CAROLINA and SUE ELLEN" a Hand Signed in Gold Pen ~a Serigraph Ltd Ed Art 334/350 ~. 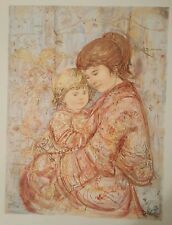 Roy Fairchild Woodard "A Better Way" Aquatint Hand Signed & Numbered Beautiful ! Wow this is a real beauty. 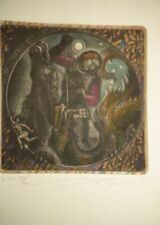 Roy Fairchild Woodard aquatint on paper. Only 385 of these were created and this is number 12/385. 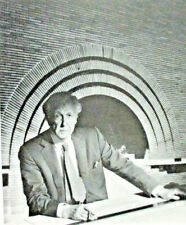 We were authorized Fairchild dealers for over 15 years and sold many of his works every month. Very nice original 1991 signed Dmitry ???. "Happy Go Lucky" gentleman portrait serigraph/silkscreen print. The image is crisp and the plate marks are evident. The piece is mounted on a back paper where it is artist signed and dated and it is behind glass. John Roddam Spencer-Stanhope (British 1829-1908). Love and the Maiden. Again we stress, that this print is not a digital copy or scan. OLDRICH KUHLHANEK 1940 -2013 Prag Czech Republic. pencil : 139 /170 SIGNED 94. LEFT HAND AND RIM. Edna Hibel received her formal artistic training at the Boston Museum School of Fine Arts, from 1935-1939. This is a limited edition lithoraph on paper numbered and hand signed by Edna Hibel. Edna Hibel was born in 1917 and she grew up in the Boston area. OFFICIAL CERTIFICATE OF AUTHENTICITY ARE AVAILABLE UNDER REQUEST ISSUED AND SIGNED BY THE ONLY PERSON RECOGNIZED AND ACCREDITED FOR AUTHENTICATION OF GINA PELLON ART. A renowned Cuban artist, Gina Pellon was born in 1926 in Cumanayagua, Las Villas, Cuba. Lovely print from 1990 year. Signed lower part. Title: Female Torso. Artist: Greg Gorman. Year: 1999. Signed: Yes. ANDY WARHOL. 'ORANGE MARILYN,1964'. AUTHENTIC 1998 ART PRINT. YEAR PRINTED 1998. PORTRAIT OF TIMOTHY LEARY. Signed by TIMOTHY LEARY. by the Artist and by Timothy Leary in Silver Ink. This is a rare Illustration print from Timothy Leary’s. Portrait of Timothy Leary holding a candle in. Laus Veneris. Sir Edward Burne-Jones ( English 1833-1898). Again we stress, that this print is not a digital copy or scan. Paper Size: 28" x 28". Signed & Dated 12-25-92 by TIMOTHY LEARY. by the Artist and by Timothy Leary in Silver Ink. This is a rare Illustration print from Timothy Leary’s. Signed by Artist CAROLYN FERRIS. by Carolyn Ferris (ARTIST). At 14 he won first prize at the annual Spring Salon Art Competition. At 15, he qualified for the Brazilian Olympic Swimming Team. With two amazing talents, França was unsure what he should do with his life. Edna Hibel received her formal artistic training at the Boston Museum School of Fine Arts, from 1935-1939. Edna Hibel "THE RECORDER" a Hand Signed ~a Serigraph Ltd Ed Art ~. This is a limited edition serigraph on art paper numbered and hand signed by Edna Hibel. The United States Colored Volunteer Infantry joined the Union Army at Fort Scott, Kansas, and fought in the Midwest during the Civil War. Fort Scott was one of the first U.S. Army installations to deploy Colored Volunteer Infantry into battle. Fort Scott was one of the first U.S. Army installations to deploy the Colored Volunteer Infantry into Battle. By: Dean Mitchell. Dean Mitchell. This soldier is safe, relieved. He has survived his "baptism of fire" and faces a brighter future.